Now this is something you don't get to see in Singapore. 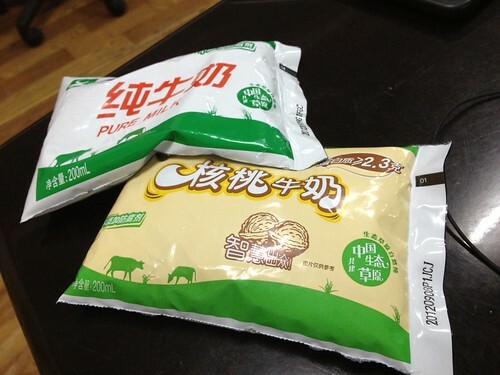 Milk in soft pouch packaging. I asked my manager the reason behind this as I thought it would be a nightmare for logistics. Goods are always being stacked to fully utilitise (vertical) space in the warehouse and I was wondering won't these pouches run the risk of bursting under the pressure of stacking weight? I was told that the Ch1nese folks don't drink their milk cold like many of us from overseas. Milk are often consumed warm especially during winter time and so a soft pouch is ideal when you want to warm the milk by immersing the pouch in a bowl of warm water. Ah. So now you know. Still doesn't explain how the storage problem is solved. Or is there a normal expectation of burst packets just like standard inventory spoilage? Arrenn: I didn't go futher into the logistics of it. My entry was just talking about the consumer habits here i.e. having soft pouch. I played around with the packet. It is rather tough as far as material is concerned and the packet was not filled to capacity i.e. there is slack for a reasonable amount of compression.